Would you be more likely to return to a fast-food chain if you knew that a particular store had obtained certification stating that its bored teenage workforce had all passed the bar for customer service and food prep? Would you rather have your food with a smile or food that is tasty instead? That’s what the ISO 9001 certification ensures for your powder coat. You’ll know that your product will be done right and look fantastic. Also – the service won’t disappoint, which is never a bad thing. Fortunately, with the powder coating industry, you don’t need to make the choice between high-quality products and your customer satisfaction. If you are fortunate enough to do business with an industry leader like Production Paint Finishers, then you’ll be able to enjoy the advantages of both. An industry certification is an achievement they take very seriously as Production Paint Finishers is dedicated to providing its customers with top-quality results. 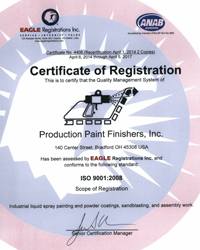 As a holder of the ISO 9001:2008 certification, Production Paint Finishers has signaled their ability to provide sandblasting, powder coating, liquid coating, military (CARC) and other related services in a consistent manner. This meets or exceeds all applicable regulatory and statutory requirements as set forth by the industry. In addition, Production Paint Finishers also continuously met their customers’ expectations. Not only is the fact that Production Paint Finishers has continuously obtained the ISO 9001:2008 certification since 2003 impressive, there are other notable facts about the company that speak volumes about its place as a leader within the industry. The military – known for being the type of customer that has an extensive list of rules and regulations that must be followed – has designated the company as a preferred powder coating business. The military is not the only company that has approved Production Paint Finishers. Well-known, global brands, such as Caterpillar, Lockheed Martin, Navistar, Tacom, BAE Systems, General Dynamics, Oshkosh, AM General and DRS Technologies, have all extended their approval of the processes and results produced by Production Paint Finishers. As if obtaining certification is not enough, Production Paint Finishers is armed with approvals from many of the major players within the manufacturing industry. This combination alone should tell you that they are a top-notch company whose quality, ethics, and workmanship are second to none. For over 46 years, Production Paint Finishers has been providing the same unmatched quality and customer service to the manufacturing industry. Come see what you’ve been missing.